The Declaration of Independence of the United States of America was drafted by a committee in which the most famous American inventor of that period was involved. Benjamin Franklin had invented the bifocal spectacles. The declaration was written nearly 50 years before the invention of photography by Niépce. Unfortunately Niépce was French, but nevertheless the USA finally reached a major position in worldwide photography business. The breakthrough came with the emergence of America's optical metropolis Rochester and other centres of camera production like Chicago and New York City. 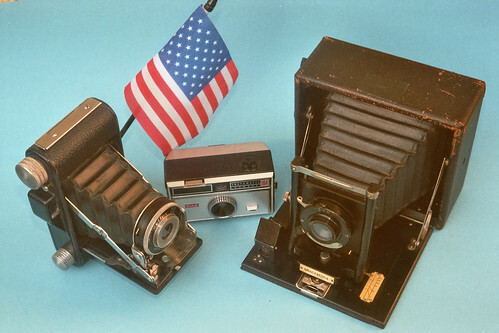 The Zar company in Chigago reached new standards concerning simplicity and cheapness of cameras and film for the mass market. But there were and are also businesses running that made or make sophisticated cameras and photographic stuff, or both, mass products and professional stuff.